Last Friday we had the pleasure of hosting the inaugural event in our Future of Place series and what an event it was. We were delighted to host our two international speakers the Co-Founder and Executive Director of New York’s famous High Line Robert Hammond and Dan Barasch Co-Founder of the city’s subterranean counterpart, Lowline who shared their perspectives on placemaking to a full house of TTF members and friends at the Art Gallery of NSW. Robert Hammond’s story is remarkable and one of enormous determination and resilience – of how he and a small team managed to transform the once abandoned West Side rail line into an elevated public park and one of New York’s biggest tourist attractions. It wasn’t an easy ride with supportive and not so supportive New York mayors and various funding challenges. Yet thanks to a hard-working team, visionary landscape architects (Hammond insists we all must hug a landscape architect! ), significant private and some public funding, it ultimately became a New York success story. Not only is the story of the High Line a compelling yarn – and our guests were rivetted throughout his presentation – but a great learning for other major cities around the globe taking on a project of that magnitude. Dan Barasch’s story is just as compelling. His vision to convert the site of the historic Williamsburg Bridge Trolley Terminal on the Lower East Side of Manhattan into a stunning underground park illuminated using cutting edge solar technology and is equally ambitious. However, his project – known as the Lowline – is in the early stages of development and facing some of the same funding challenges faced by the High Line. Unlike here in Australia where Government support is more readily available for urban regeneration projects involving public space both the Highline and the Lowline are largely reliant on raising the funds themselves to develop and maintain their projects. In Barasch’s case he needs to raise $100 million to fund the development and will use several sources including crowd funding which he has used in the past to fund the initial stages of his project. Despite the challenges he faces I have no doubt he will succeed and look forward to visiting the completed project some time soon. 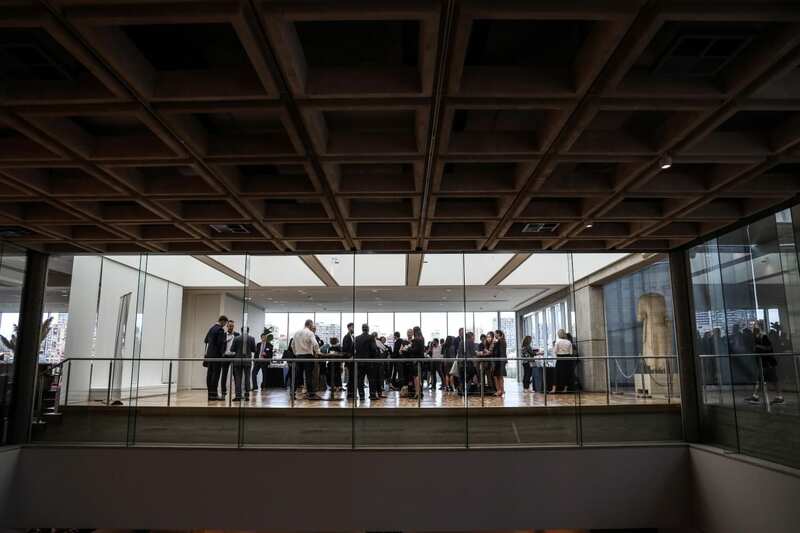 Our two excellent keynote speakers were later joined in a panel discussion by Lendlease’s Head of Urban Strategy and Place Development Seamus McCartney and the Deputy Director of our very kind hosts the Art Gallery of NSW, Maude Page. Seamus spoke about some great Sydney examples of successful placemaking projects that Lendlease has been involved in from the pioneering Australia Square to the more recent and outstanding redevelopment of the International Convention Centre and its surrounds at Darling Harbour. Another game changing Sydney project that Lendlease have played a significant part in – the Barangaroo precinct and the wonderful new public spaces that have been created there were also highlighted by Seamus. And it’s not finished yet! There is still more to come. The Gallery’s connection to its home on the edge of the Botanic Gardens and the Domain and the new public spaces included in the design are an important part of the vision, but I have to say I’m particularly excited about the underground World War Two oil tank that is being converted into its very own gallery space while still preserving its original features. Maud talked about the importance of collaboration among Sydney’s cultural institutions and I couldn’t agree more. Great news is that they are all working well together and will continue to work more closely and that can only be better for our visitor economy. While there is an ever-increasing demand for housing and development around the world as cities grow and develop, it hasn’t, and nor should it, stop city planners and design professionals from inventing new and innovative ways to incorporate beautiful new green spaces, clever community spaces or transport options, in and around urban structures. Our Future of Place series will continue to profile and debate the key developments in the placemaking movement at home and abroad and we are excited to see where it takes us. Stay tuned for details of the next event in series in the weeks ahead. As we sign off for the long weekend I would like to wish all our members a happy and safe Easter.